Who Is Going To Do What By When? I’ve heard great things about our satellite endoscopy suite at 21 Eastern Ave. so on Tuesday I decided to visit and see the suite for myself. I was impressed with the facility; it offers easy access for patients right off the highway and parking that can’t be beat. In addition to getting a tour, I heard from our caregivers about some of the challenges they face now that they are taking care of sicker patients, using new drugs for sedation and increasing the volume of patients undergoing endoscopy at the site. 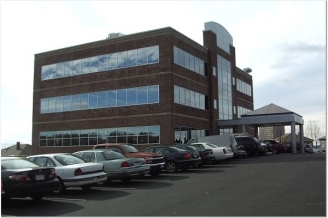 Based on their patient satisfaction scores and their productivity you would assume that everything was perfect at 21 Eastern Ave., but numbers are the language of distance – the language that allows us to sit back in our offices and assume all is well or criticize a unit’s performance because of the results posted on a spreadsheet. To truly understand how things are going, one must go to the place where the work is done and see for first-hand. Huddle at 21 Eastern Ave. The caregivers at Eastern Ave. had wonderful ideas about how they could improve performance and make life better for our patients and our providers, but they didn’t feel like management was listening or that they had the ability to implement their ideas. This is probably the most common complaint I get from caregivers when I round. “We have ideas about how to make the place better but no one is listening to us.” The assumption is, therefore, that no one in management cares. That’s simply is not true. The problem is that we have inadequate processes in place to ensure that we listen to our caregivers, prioritize their ideas and execute the very best of those ideas. The fledgling process we have put in place is our idea boards. We now have over 400 idea boards up across the organization. The idea boards are intended to be the place where management and front-line caregivers huddle on a regular basis, talk about how we can make life better for our patients and our people, decide which ideas to implement, and track their execution, which is all about who is going to do what by when. Like at the idea board at the Anticoagulation Clinic. 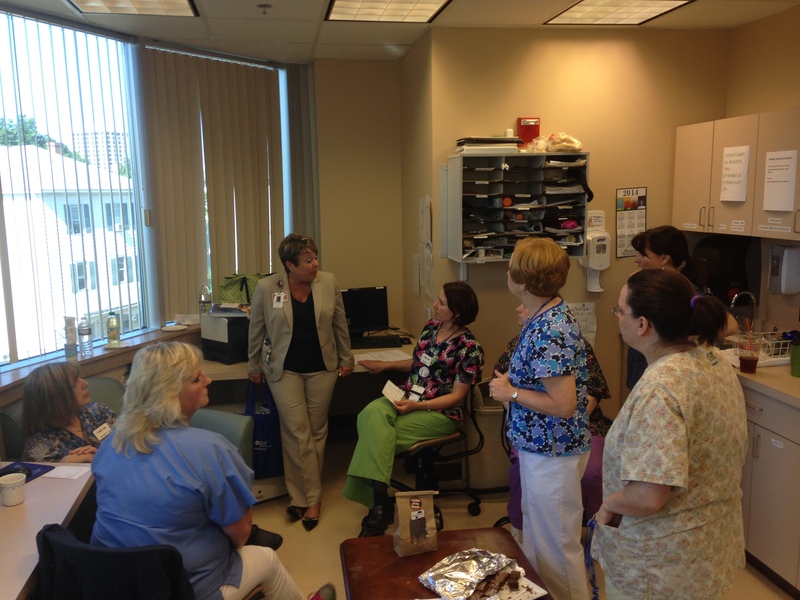 This team, which routinely has the best patient satisfaction scores in the Medical Center, meets weekly to discuss new ideas and is disciplined about who is going to do what by when, and because of that, they have a pile of implemented ideas. 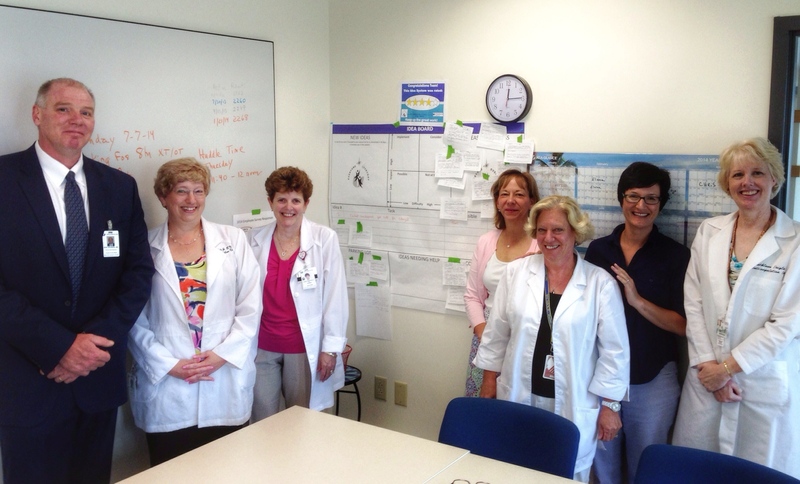 Unfortunately, not every unit is using the idea board the way the Eastern Ave. team and Anticoagulation Clinic are. Too many of them may have been put on the wall because “Dickson said we had to,” with the assumption being that this would go away after a while like lots of other initiatives. Idea boards and huddles are not going away; they represent the management culture change that must occur in this organization. If you are a manager here you must have a place where you huddle and work to implement the ideas of the front-line staff. We must become the management team who serves the people that serve the patients. While I was meeting with the caregivers at Eastern Ave. several ideas came up, and I was thrilled to see that “management” started working with the caregivers to implement some of them within 24 hours. This entry was posted in Employees, Idea System, Patients, Quality by Eric Dickson, MD, MHCM. Bookmark the permalink.